Debunked: WTC: Multi-ton steel sections ejected laterally. Discussion in '9/11' started by Mick West, May 28, 2013. The claim that "Multi-ton steel sections ejected laterally." is often made in the context of 9/11 controlled demolition conspiracy theories. 1. Bouncing. Not off the ground, but off the uncollapsed lower portion of the building. The falling vertical speed was partly translated to horizontal speed. 2. Tilting. As the floors were stripped away from the exterior walls they leaned outwards, when large sections leaned, they were essentially pivoting about a fixed base, allowing the tops to get some speed. 3. Elastic rebound. When you snap something by compressing it, it's put under stress, and then that stress is released, causing sections of the object to fly off. 4. Blast effects. Highly compressed gasses can make things move, even throw them considerable distance. However it would have much more of an effect on lighter material. There's two sources of compressed gasses. 4a. Piston effects. Thousands of tons falling onto a concrete slab will rapidly push it down, making the space below it smaller, and massively compressing the air in that space. This is likely the source of the blasts of debris seen coming from windows, but would not move large sections much. The above is a SUMMARY POST, and contains material from the following thread. 17. 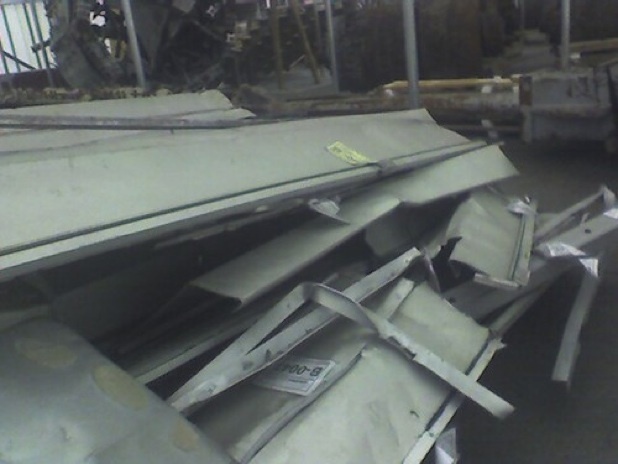 Multi-ton steel sections ejected laterally. Why couldn't a girder just have fallen and bounced? How much explosives would be needed to throw a girder sideways, and how would you place them? Not sure what you mean? Bounced off what? Why would anyone want / need to throw a girder sideways..? The uncollapse portion of the building. Since the collapse wave was a bit slower than free-fall, any free-falling debris inside the perimeter of the building would impact it at some point. Drop a pen angled at 45 degrees on the edge of your desk from three feet up. I suppose I should ask: how many feet would a girder need to fall before gaining enough energy to 'bounce' itself to the outer limits of a 1,200 foot debris field? How much of this energy could be absorbed by the 'bounce-off' platform while still permitting such extreme 'bounces'? Which shape of structural steel would be most likely to 'bounce' the farthest? Can you present any visual evidence, whatsoever, that 'bouncing' is how these sections were ejected? This leaves the issue of explosives open to further investigation but certainly refutes the official narrative, supporting the potential that a comprehensive cover-up may have been carried out. Why are you ignoring this, Mick? So not only did you not focus, you avoided the questions entirely. Just saying, essentially, "that's what it looks like". If you claim " the angle and velocity of these ejections suggests an explosive force far greater than what is permitted by the official collapse narrative." then what ejection are you referring to (and please stick the original point here, with specific examples of "multi-ton steel sections", what is being ejected (identify it in the image/video), how big is it, what does it weigh, what is the angle, what is the velocity, how are you measuring it, and what explosive force would be required? I'm referring to the entire layout of steel sections within the debris field. Analysis of the visual record is there for all to see and cuts through a much broader spectrum of potential human error, being verifiably superior to the flawed works of NIST, Bazant, other propagators of the official narrative, as well as AE911Truth. The peeled perimeter characteristics typical of ROOSD [Runaway Open Office Space Destruction - basically the floors being stripped from the columns] are quite obvious in this photograph -- the upper portion having fallen out and over beyond the lower portion. If you assert these sections have 'bounced' into their final position, you've got a long way to go to prove your theory. Every available account of the visual record shows, clearly, that the upper portions fall over and out beyond the lower portions during each collapse -- not on top of them. More importantly, the angle and velocity of these ejections suggests an explosive force far greater than what is permitted by the official collapse narrative. This isn't to suggest that ejected steel sections necessarily had explosives attached but, rather, that there was an explosive force that is not accounted for by Bazant, NIST, or the 9/11 Commission. I suppose I should ask: how many feet would a girder need to fall before gaining enough energy to 'bounce' itself to the outer limits of a 1,200 foot debris field? How much of this energy could be absorbed by the 'bounce-off' platform while still permitting such extreme 'bounces'? Which shape of structural steel would be most likely to 'bounce' the farthest? You ask, but you don't answer. What I'm try to do is to get you to go past the argument from personal incredulity ("I can't imagine how .....") and to actually put some numbers to your argument. And I'm trying to get you to focus. Even in this this one point you have already conflated two issues - the flying debris and the outward collapse of the walls. Let's get to the nitty gritty, how many feet would a girder need to fall before gaining enough energy to 'bounce' itself to the outer limits of a 1,200 foot debris field? The girder bounces sideways at horizontal velocity v, and vertical velocity is back to zero. It falls an additional (h-x) feet, and when it lands it is 600 feet (d) away. So if it travels d feet at speed v, then it takes t = 600/v seconds to do it. t is also the time required to fall (h-x) feet. i.e. it falls 100 feet, bounces to horizontal, falls another 900 feet and ends up 600 feet away. Since we have 80 feet/second lateral velocity, that's 7.5*80 = 600 feet horizontal. Now, obviously that's a simple model. But let's go one step at a time. Do you agree with the math so far. If not, then point out the error, if so then we can move on to more detailed analysis. Mick, your logic leaves me flabbergasted. Please allow me to help you. We use math to prove a theory or to test a hypothesis. In order to formulate a hypothesis, careful observation serves the leading role. 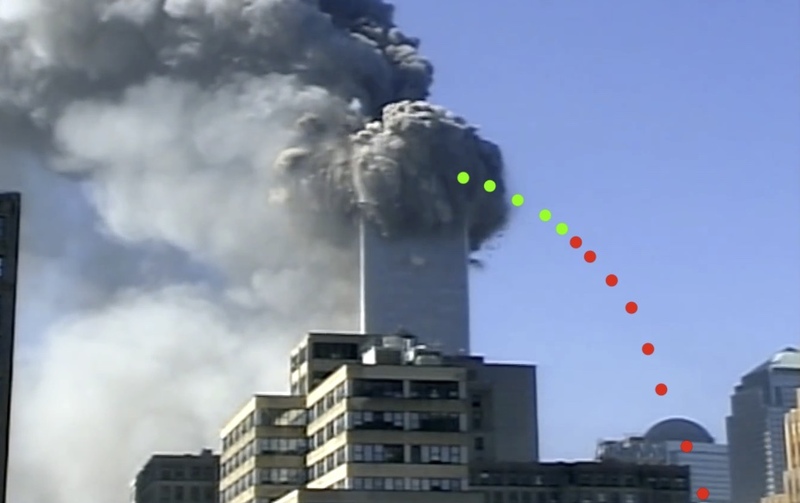 It is completely pointless to begin calculating how ejected steel sections might have possibly 'bounced' hundreds of feet when the visual record shows, clearly -- particularly with the WTC1 west wall and the WTC2 east wall -- that this is not the way it happened. Still, you make the assertion that *all* of the WTC steel was ejected in this manner. Please provide a visual reference showing at least one multi-ton section being 'bounced'. Since claims pertaining to observation of the visual record can be immediately verified by anyone and leave much less room for misunderstood variables, whatever hypothesis we conjure must fit the visual evidence. The only hypothesis that fits the record is a ROOSD collapse progression. We need not go any further than to simply *look* at the evidence. If you believe something is happening that does not meet the eye, again, you've got a long way to go to prove it. If you'd like me to entertain your inclination toward drawing out equations for imaginary collapse progressions, I'll continue to read. But if you want to get serious, start by referring me to one of the many collapse videos where I can see a multi-ton 'bouncing' in action. Point out which specific ejection you are referring to and where the 'bouncing' impact occurred. You now want to change the subject to peeling/leaning sections? Or am I misunderstanding "ejected"? Still, you make the assertion that *all* of the WTC steel was ejected in this manner. I did? Where did I say that? I'm simply providing proof that some pieces of steel would end up a considerable distance away from the tower. Are you saying that by "17. Multi-ton steel sections ejected laterally." you just mean the sections of the exterior wall that fell over after they lost their lateral support? Can you quote the bit of the sharpprinting article that matches #17? I see what tommy1234 is getting at...you just used math to prove your own theory on what could have happened (the bounce...where is there actual evidence of this taking place?). But the video evidence shows what really happened, and it's plain to see ejection of these pieces of steel. I think if you want to prove it happened contrary to what the video evidence suggets, your only option is to show video evidence supporting your claim, not proving mathematically how it COULD happen. Can you show me one beam in particular that you think looks like it has been "ejected". Link the video, and then identify the particular beam. That's pretty much impossible, as there's a large cloud of debris that obscures the regions where the bounce might have started. But there are no unexplainable beams that Im aware of. The walls peel away, and the interior falls. Things also bounce. One can disprove the "ejected" notion simply by noting that no debris at all is observed to go up. It all goes down. If there were massive explosions tossing steel beams around then some things would go up. Scroll up. I see a couple videos that I've watched and I'm pretty sure I see things flying outward. Is this normal for a building which has caught fire and is collapsing? I can't seem to find any other examples of this happening, but maybe I'm not looking hard enough. Is there some structural difference between this building and other buildings which have collapsed from fire damage? Also, what makes you come to the conclusion any of the debris would go upward? Explosions do not discriminate. 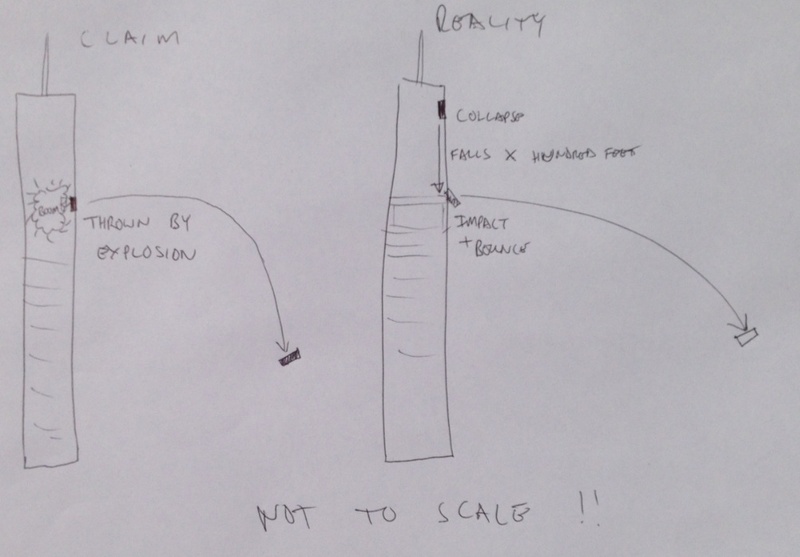 Why don't you draw a diagram explain how an explosion can "eject" a beam? 2) Falling objects bounce, imparting some horizontal velocity. 1) Stand the pen vertically on the edge of the desk, let it topple over and fall to the floor. Do it a few times. How far does it go? Try from the top of a book case. 2) Hold the pen two feet above the edge of the desk. Drop it so it hits the edge at a bit of an angle. Do it a few times. How far does it go? Scroll up. I see a couple videos that I've watched and I'm pretty sure I see things flying outward. Is this normal for a building which has caught fire and is collapsing? I can't seem to find any other examples of this happening, but maybe I'm not looking hard enough. Are you saying those buildings you've shown were on fire and collapsed due to that fire damage, and were not controlled demolitions? Also, I understand falling objects bounce. But the video/gif shown (of wtc7) doesn't show the ground or the bounce. So what does it have to do with anything? Why prove beams will bounce? Of course things bounce. Anything that fell from the building, irregardless of how the building went down, would bounce in some way. Also, if you look on the left side of the wtc7 building, just as it begins it's collapse, I can see something shoot out. I can't identify it,but according to the size of the building I would say it's pretty big. Why is that? Is that simply from the walls 'peeling' and toppling? I'm not sure what to make of it. And lastly, no, lol, I won't draw a diagram for you showing how beams would be ejected outward. I'm not making that claim; I'll leave that one to the thread starter. He made that claim pretty boldly. They were controlled demolitions without the use of explosive. They just push out one floor, then the building collapsed like the WTC did. The bounces I'm referring to are off the high parts of the building, not off the ground. The un-destroyed part of the building is still solid. When the debris front hits it, some of the looser debris will bounce off. This will happen every floor. Of course, none of these were steel-framed buildings; Verinage is not used on steel-framed buildings. Of course, Verinage is a controlled demolition technique involving precise hydraulic movements across parallel sections of the building -- a precision you are suggesting was achieved by impact and fire. We are discussing the "ejection" of things here. Precision is not an issue. If you want to discuss precision, then start a new thread. 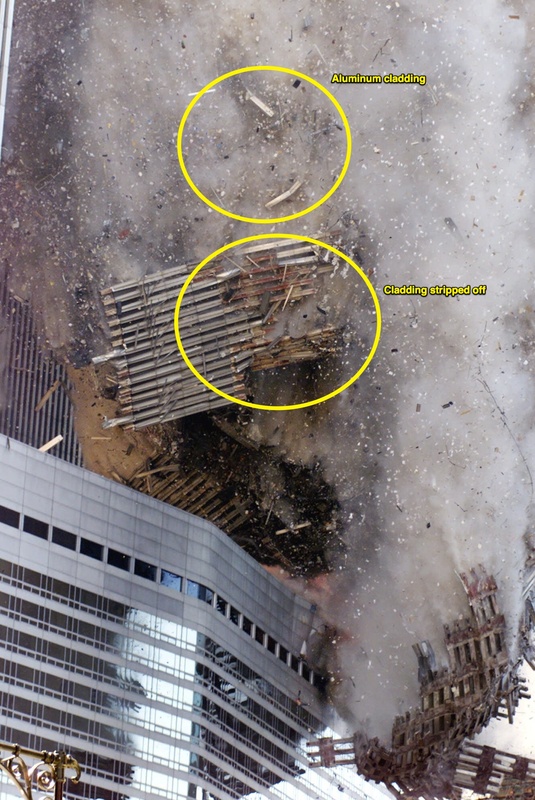 The verinage clips show a very similar pattern (to WTC) of debris falling away from the building. It's quite possible that some of the things are office furniture, partitions, conference room tables, etc, - if they were close to the exterior. The aluminum cladding makes sense flying outward, or as you said anything that may have not been damaged by the fire. However, I'm confused here. You are trying to say that building 7's collapse wasn't controlled demolition, that it was caused simply from the extensive fire damage inside. But you show us a couple examples of controlled demolitions to illustrate your point. How does that work? Why not show a building collapsing the way wtc7 did that was caused by uncontrolled fire damage? I can't seem to find any examples that are remotely similar. There is a lot of great information in that article from experts in imploding buildings. facts as they relate to scientific principles of gravity, explosives, and structural failure. responsible for the removal of debris from Ground Zero. Director of Field Operations at Protec Documentation Services, Inc.
Michael Golden and John Golden. investigations and intense media hubbub). conclusions from hot metal or Chuck Jones is drawing dynamite in the hands of Wile E.
Thus far, every assertion we have investigated scores a resounding 0 for 3. Our team welcomes the opportunity to review additional data as it becomes available. render their contributions productive and valuable. I use screws often (small bolts). When accidentally dropped in my studio, they often hit something on the way down....and end up sometimes several feet away from the point dropped. They bounce. Even if they hit nothing, their semi-forward motion continues on a path of inertia......outward. Beams and steel columns are heavy, though their weight does not excuse them from bouncing.....or excuse them from following a tipped inertia. What we see in simple videos is only the outermost building pieces falling. We cannot see inside the dust, where much (most) of the action is happening. There must be bouncing in amongst the dust....in the heaviest core of the collapse.......we just don't see it. Even "if" there were explosions....bouncing would still happen, in the relative chaos of any collapse. I did. But that doesn't explain why mick would adhere to wtc7 building collapsing due to fire damage, and then show us pictures of buildings collapsing due to controlled demolition. These may produce similar results, but they're not the same. Apples and oranges. It's actually misleading. Not to mention, the building you just showed, the technical college, only partially collapsed. Because I'm keeping the thread on topic. The building collapsed, that's quite obvious. Steel sections ended up some distance from the building, things fell away from the building. I was demonstrating with the Verinage collapses that that's simply what happens when a building collapsed. The HOW it collapsed is a different subject. New here...and I have a question. Could the beams they claim were found "two football fields" from the WTC been the be the direct by product of the planes crashing into the towers?...By that I mean, the two jetliners impacted a number of beams and supports...couldn't that momentum have propelled those pieces to their far flung locations? With regard to "ejecting" I see absolutely no pieces "ejected". I see debris falling which seems to be consistent with other debris falling consistently with a collapse. There certainly were some steel beams ejected by the impacts, however there were also beams off to the sides, and behind the impact point. I think it's all explained above. There were no large quantities of steel "beams" projected from the twin towers. The facade came down with the towers by two mechanisms (seen in the pics and vids)... tip and peel, and slip and drop is how I describe them. The slip and drop fell quite close to the facade, the tip and peel fell up to 450' from the face, with the furthest steel seen are the facade panels from the west face from about the 84th floor or so. These came from over 1,100 feet high. The tip and peel debris was in multiple panel assemblies of the 10'x36' panels coming off the tower attached in sheets. Some of the were almost the full width of the building and up to 15 or more stories high. These large assemblies can be seen on West street post collapse arrayed in the pattern they were assembled in. The tip and peel assemblies are the result of the rapid runaway floor collapse leaving the facade with no lateral support and too slender to stand. The floor collapse provided sufficient impulse to the facade to tip it away from the tower. Multiple panel assemblies can be seen sailing through the air toward the World Financial Center. This massive one impaled one panel into the 20th floor of the AmEx tower and continued to reach as far as the barrel vault of the Winter Garden. It's certainly possible that as the frame came apart, some steel columns would be sprung free. There were no explosions causing any steel to be "ejected" hundreds of feet. AE911T is even wrong at the distance. They claim 600 feet and the furthest found steel was 450'. Just made a slightly better illustrative video of something falling vertically and then bouncing horizontally, slowed down to be more to scale with the towers. The basic parameters were a drop from 52" above the ground (h), falling a distance of 19" to impact (x) and traveling sideways a distance d.
so with h= 52, x = 19, we get d = 49"
So what does this mean for d? If we are only traveling for 0.57 of x, then we need to calculate d for a value of x that's 1/0.57 the length, or about 1.75x as far. so for 600 feet, we would need x = 1052 feet, which we can't actually get with my math, as it requires h>d, so what about the 400 feet that Darfus was asking about? That would be 400*1.75 = 700 to account for the efficiency, so x = 142 feet. So a girder dropped from 1000 feet above the impact point would have to drop 142 feet before the bounce to end up at that point 400 feet away. I don't understand how various portions of the truther community use both the fact that the towers fell into their own footprints and the fact that debris was ejected too far as proofs of CD. How are both possible? Here's video I took of the girder bounce experiment. Great to see that concept put to experiment. It's déjà vu for me. Back in 2008 I was responding to one or more of the "beams ejected by explosives" claims and interacting with psikeyhackr over the maths of fall to ground parabolas of horizontally ejected pieces given various horizontal starting velocities. 2) A "bowling" action as a falling sheet of columns falls over flinging a loose beam from the top part. ....and I never did the physical experiments fir either. Wasn't till years later that I became aware of Major_Tom's research into where the perimeter sheets broke - peeled - (some) rotated and fell. And that humungous 30(?) storey piece that fell as a single sheet and - by a "bowling" action - impaled that beam into the WFC. Still haven't any visual proof for the other 6 or so beams that were the outfliers into other buildings. the WFC (aka the AMEX building) is the green pyramid roofed building on the right. You can clearly see the huge mass of the outer wall of WTC1 tilting towards it. Red is what is visible, green is my extrapolating backwards. It's clear this large mass movement isn't bouncing (and even more clearly not the result of an explosion). I guess you could illustrate the principle with a Jenga model, but I don't think it would be possible to get any useful numbers. They weren't ejected in the first place... the steel found far from the towers was from high high floors and it toppled over and fell as part of huge assemblies of multiple panels. Ejected is a code word for "exploded".... pure nonsense. On the face of it this could explain what was seen - except that these 'huge assemblies of multiple panels' have been measured as leaving their stationary position and accelerating to achieve speeds around 60mph inside the first couple of yards. When questioned, proponants of the 'toppling' theory go on to explain that these sections are made to break away at the top and both sides - but not at the base. The fixed base is then seen as a hinge around which the section topples sideways to produce the lateral movement. But the question remains. What force caused the massive sections to break free on three sides only and then 'topple' sideways with huge acceleration and at a measured velocity far in excess of that possible by a gravitational 'topple' about a fixed point. If it is claimed to be falling steel from above that provides the motive force then that must be shown to be travelling at least at the same lateral velocity of the 'toppling' section. That would be essential to produce an equal and opposite force to avoid contravening Newtonian laws. But that isn't seen or measured. So what other massive force can cause multiple tons of steel to break free and accelerate sideways so rapidly over a yard or so? If gravity can't do that then what other cause can be considered ? The acceleration over such a short distance is the part that I find hard to reconcile with the 'topple' theory. That's rubbish.... Show me your so called proof or evidence... love the use of these words... that they accelerated to a speed of 60 mph in the first couple of yards. The mechanisms to understand the toppling is settled science. The observed motion demonstrates established mechanics. The facade was held plumb.... laterally braced by the floor system. The ROOSD process of floor collapse (call it any name you want) left the facade without lateral bracing... and increasing unstable as the slenderness ration grew. It's more than likely.... that the descending floor mass... growing in volume and the air below it between each slab ... forced out of the way of the falling ROOSD mass.... exerting outward lateral forces which caused the facade to bulge and break free and topple in panel assemblies of varying sizes. Of course the top moves laterally (in an arc) as it descends. What is the speed of the top of a flag pole which falls over? It accelerates from rest to???? But it sure as hell doesn't accelerate to 88 feet per second in 2 meters and neither did the top of the the toppling assemblies of panels. Its some years since I looked at this and spoke from memory. But it seems that it was Chandler who first did the calcs on the speed of ejections. It was fully discussed at the time in this forum thread. His observations and measurements of video evidence show ejection speeds as I remembered. Note that although some dispute arises in there about angular distortions causing false measurements, the basic results are not overturned. In fact if the material is moving other than at 90 degrees to the camera then a higher real speed would be more accurate if the assumption he used was that it was at 90 degrees to the camera. Simple vector calcs would show that. He was therefore showing the minimum speed to avoid such challenges. I assume that if such velocities can be proven then you would accept that the 'settled science of toppling' cannot explain that.